Penwell Enterprise has been providing roofing and decking services to the Eastern Panhandle of West Virginia including communities in Berkeley, Jefferson, and Morgan Counties since 2000. Locally owned and operated, Penwell Enterprise is licensed and insured. Protecting your home, garage, business or out-building with a high quality roof is the best way to assure a long-lasting structure. Whether from storm damage or general deterioration due to age, Penwell Enterprise helps clients choose the best roofing solution to fit the budget. Our team is professional, courteous and has experience to complete any roofing project. Although roofing is our specialty, Penwell Enterprise can also provide high quality deck design and construction as well as many other construction projects. Penwell Enterprise offers Roofing, Storm Damage and Decking Services for the Eastern Panhandle of West Virginia. Penwell Enterprise specializes in building and repairing decks. From small stoops to large spacious decks perfect for outdoor gatherings. Using only the highest quality materials available, Penwell Enterprise will be sure to make your dream deck a reality. We offer a complete one-stop-shop for all your after storm damage and hail damage needs. From removing down trees to repairing broken windows, damaged siding, hail damaged roofing and more, the storm experts of Penwell Enterprise will have your home as good as new in no time. 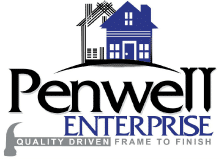 Penwell Enterprise has been locally owned and operated since 2000. Our specialties include Deck building and repair, Roofing and Storm Damage Repair.